CytoVac chose first to focus on patients with prostate cancer, since these patients have significant treatment needs that are not covered by existing treatments. The patients that have been entered into these studies are late stage Prostate cancer (Castrate Resistant Prostate Cancer (CRPC)) patients. Both patients with and without metastasis have been included. From the phase I testing of ALECSAT it is seen that the immunotherapy treatments are well tolerated safe and applicable for prostate cancer patients. There have been several positive indications for clinical effect; however, due to the low number of patients exposed no statistically valid efficacy conclusions can be made. So based on this clinical phase I data, ALECSAT treatments of Prostate cancer should move to clinical phase II testing where statistically relevant efficacy data may be obtained. CytoVac aims to explore this opportunity in collaboration with a partner. In 2009 CytoVac started the first clinical phase I trial in patients with Castrate Refractory Prostate Cancer (CRPC), in collaboration with leading physicians at Urology Clinics in major Danish hospitals. This study was completed in 2010. The key focus of this study was to show safety and clinical applicability of ALECSAT treatments. Each of the 13 patients were treated with a single dose of ALECSAT cells. ALECSAT treatments were seen to be well tolerated and no side effects that could be associated to the treatments were seen. The ALECSAT productions, logistics and handling of treatments in the hospitals were successful. For several patients positive indications of improvement and clinical beneficial effects could be seen. In the study transient drops or stabilizations in PSA levels were observed and also possibly some slight effects on the growth of bone metastasis. In 2011 CytoVac initiated a second larger clinical phase Ib (HRPC) prostate cancer trial, this trial was completed in October 2012. In the first study, patients were treated with only one dose ALECSAT in this second phase Ib study, 20 patients have been treated with 3 doses of ALECSAT. Repeated ALECSAT treatment was seen to be well tolerated and no side effects that could be associated to the treatments were seen. For several patients positive indications of possible improvement and clinical beneficial effects could be seen: In the studies repeated drops at ALECSAT treatments and indications of stabilization or drop in the rate of increase in PSA levels were observed. 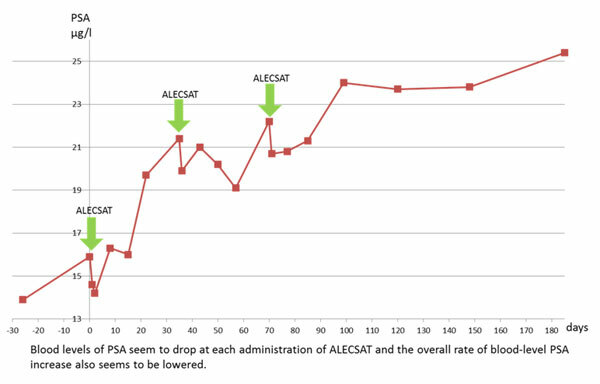 These effects were increased and prolonged by repeated ALECSAT injections and there was a tendency for some patients towards that the overall rise in PSA serum concentration was lowered after three ALECSAT injections. Effects on the growth and frequency of bone metastasis were seen in some patients. Results from the two clinical trials are very promising ALECSAT treatment of prostate cancer patients is seen to be well tolerated and there are no side effects. For most of the patients some positive indications for clinically beneficial effects are seen – even though these patients are at a very late stage of their disease. – Reduction in size and number of bone metastasis. These are encouraging results, but only a few patients have been treated, so these preliminary results should be further corroborated.